Welcome to our complete meagle guide. Meagles are hybrid dogs. They have one miniature pinscher parent and one beagle parent. 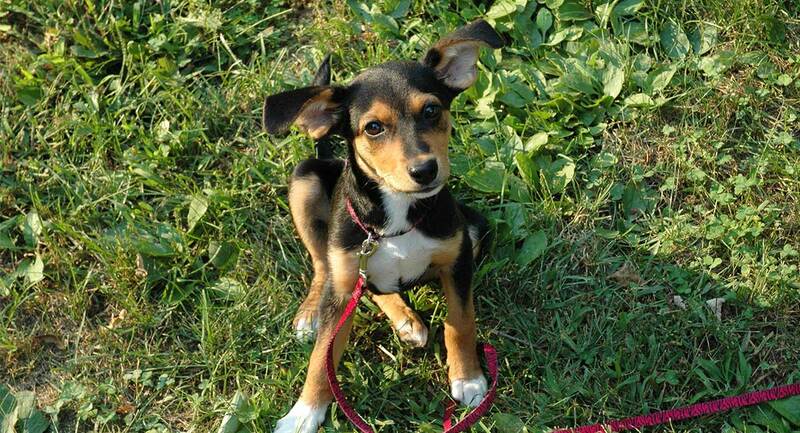 For the lucky ones, the meagle will be a lovely mix of the ever-popular beagle and the fun-loving min pin. However, it should be said that not every min pin beagle mix is created equal. The outcome of breeding these two may not be what you expect. In this guide, we’ll let you in on all of the secrets of the meagle puppy—their appearance, personality, health and how easy they are to train. The little meagle is one that will attract any family looking for a family pet. Its beagle pinscher shape and beagle colors make it rather attractive. The meagle is a cross between the miniature pinscher and the beagle. Now, the meagle is a crossbreed, which often puts it in the hot seat for breeds circling the internet. Let us explain why this is. While most people will call crossbreeds mutts, we call them designer dogs, given the breeder purposely breeds them together to create this designer breed. Snorkies, puggles and cavapoos all fall under this category. And so do meagles. As a whole, purebreds are predictable and designer dogs much less so. That, among many other things, is one of the reasons that there is such a controversy between purebreds and mutts. One of the reasons that breeders often look down upon these mixed breeds is because they see them as an insult to their job. With designer breeds becoming more popular, it’s thinning out the bloodlines of purebreds everywhere. Carol Beuchat Ph.D. of The Institute of Canine Biology digs deeper into exactly why so many professionals are not accepting these new breeds. But more than that, she explains heterosis, which is the tendency for crossbreeds to be superior to their parents. This is similar to the legend that a vampire/werewolf hybrid would be stronger than either parent. The truth is that while some problems with breeds may fade away, others will also be acquired when mixing them. This is why Dr. Beuchat focuses more on the harm of inbreeding than crossbreeding. But still, let’s take a look at each breed individually as traits are inherited from both breeds. One Side of the Meagle: What Are Min Pins? The exact century that the miniature pinscher was first bred isn’t readily known. It is believed that they were first simply small Dobermans. This explains their independence, but more on that later on. The fact that they may be bred from Dobermans is easy to gather from the name. However, some experts believe that they are a cross between a dachshund and greyhound, given their appearance. Considering the controversy, we don’t really know much about their history besides the name itself is German. The Other Side of the Meagle: What Are Beagles? Beagles are easily one of the world’s favorite dogs, with it being the fifth most popular dog in existence. This has been true for centuries or possibly longer. It is said that the beagle has been around since before 55 B.C. as it was one of the first widely known dogs on earth. Like the Egyptians’ cats, the beagle was there for those less fortunate than royalty. Back in the day, they were most commonly used for hunting. But these days, plenty of people love adorable beagles as pets. What About the First Meagle Pup? Like most designer breeds, the meagle’s exact origins are unknown. However, more than likely, the first meagle was bred in the United States. With this new breed, you get the extra friendly Beagle and the fearless predator that is the min pin. They make quite the dynamic duo. A beagle generally weighs under 30 pounds and is no taller than 15 inches. A miniature pinscher is quite small at less than a foot tall and less than 10 pounds. This means that the min pin weighs a third as much as a beagle at its heaviest. This bit of knowledge lets you know that the meagle definitely won’t be more than 30 pounds. If it gains more of the min pin’s characteristics, then it could be much smaller than that. Most litters will have quite the range in sizes, making it even more exciting. Looking at the two parents side by side, aside from size, the biggest difference you’ll notice is those ears. 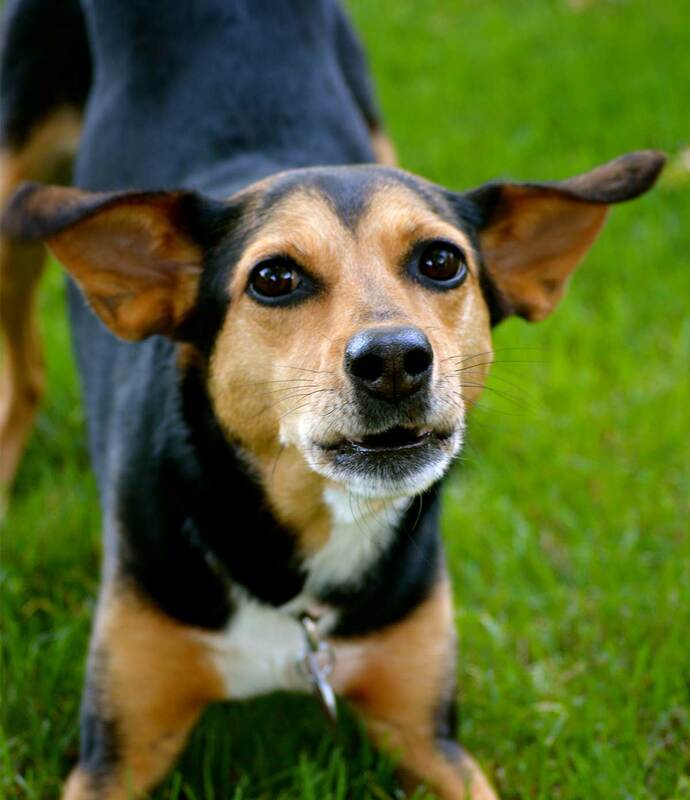 The beagle has soft, floppy ears whereas the miniature pinscher has sharp, pointy ears. The beagle has round, large, hound eyes while the min pin has dark, oval eyes. As far as coat goes, the beagle’s coat is only slightly longer and softer than that of a miniature pinscher. The beagle usually is mixed in colors while min pins are rust, with black thrown in rather often. Given these descriptions, you can imagine what your meagle may look like. But then again, as with any designer dog, can you ever really imagine their beauty? Keeping up with grooming requirements is not a difficult task with this pair. The miniature pinscher is a loving breed that is also very intelligent. That said, they are smart enough to test their limits and can be defiant. The beagle, on the other hand, is a docile breed with humans that does well with positive reinforcement. When mixing these two temperaments, the outcome changes greatly depending on the exact pup. In general, meagles are usually a friendly breed that loves to play. They’re not on the high side of energy but not aloof either. If properly trained, the meagle will be your dream dog. However, with the pinscher’s independent attitude, if left alone, you could have your hands full. The miniature pinscher needs his training, whereas the beagle will more naturally become agreeable. It’s important that you be patient with the beagle side of this dog as “punishments” get nowhere with the otherwise agreeable breed. It’s important as well that early on you introduce the pup to kids, other dogs and people with hats. And if you plan on having cats, then add in those too. It’s not the beagle’s fault it was bred to be a bunter. If you get stuck, remember that puppy training classes can be very helpful. Due to their short coats, the beagle and the min pun are both low maintenance dogs. They need grooming, but it’s nothing we can’t handle. The min pin is exceptionally easy to groom. A weekly brushing is all you’ll need for his fur. And baths? This dog’s natural need for bathing is much less than most other breeds. As for the beagle, things slightly change. They do better with seasonal care. They will need to be brushed more often in the winter and spring. During this time, you’ll need to bump brushing up to three times a week. As far as bathing goes, you can stick with moderately. Since their fur is so short and healthy, bathing is reserved for sticky situations. Since both dogs are low maintenance, you can stick with a weekly brushing for the meagle pups. Both the beagle and the miniature pinscher are purebred, pedigree dogs. This means that professionals have already found out which health problems are inheritable. Many of these problems can be passed onto the meagle. While the miniature pinscher is generally a healthy breed, there is one problem that is rather common: hypothyroidism. This is the result of a decrease in the amount of a certain type of hormone in the body. The most common symptoms of hypothyroidism are lethargy, weakness, failure to thrive, hair problems, skin infections and sensitivity to cold. Blood count and urinalysis will likely be needed to test your dog for thyroid problems if symptoms persist. The beagle can have many health risks, but a common one involves the eyes. While many have glaucoma, CPRA and cataracts, one common problem is known as cherry eye. Cherry eye consists of protruding red areas in the eye. The vet will evaluate these masses and decide whether they are safe or if the dog’s glands need replaced. With so many eye issues, it’s important that beagles and meagles alike receive regular eye examinations. The beagle parents should also have an updated clear eye test and DNA tested clear for PRA. If you’re lucky, your meagle will inherit more of the healthy min pin’s characteristics as far as health goes. Getting a meagle isn’t exactly an easy task, as is true with any designer breed. But that doesn’t mean that with a little determination that you can’t find your perfect fit. One of the most important things to consider when picking out a puppy is the health of the meagle puppy. Remember that beagles have more health concerns than min pins. If you prefer a healthier dog, then statistically, a pup with more min pin traits will have less health problems. However, since these are mixed breeds, even health concerns are unpredictable. Keep in mind too that since “meagle” is trending, that puppy mills and others illegally selling these dogs may try to give you a raw deal. In order to promote the lawful, kinder breeders, use this guide for your perfect Meagle Puppy hunt. Is a Meagle Right for You? How do you know if the meagle is the perfect dog for you? Here are some things you might want to consider. The beagle pup is prone to health conditions in its old age whereas the min pin is rather hearty. If you can’t invest time in training, then the min pin side will take advantage of your lack of authority. Grooming is rather low maintenance, but you’ll need to clip nails and brush teeth on a regular basis. If nothing has turned you away yet, then it looks like you’re on the right track. But what about if you have kids? Beagles are known for being amazing family dogs. They are friendly and eager to please. The miniature pinscher, on the other hand, will try you. It takes a strong-willed adult to overcome them. But either way, this is a mixed breed we are talking about. As with all mixed breeds, the result is excitingly unpredictable. Do You Have A Meagle? Let us know why you chose your meagle and what your concerns about the meagle are.